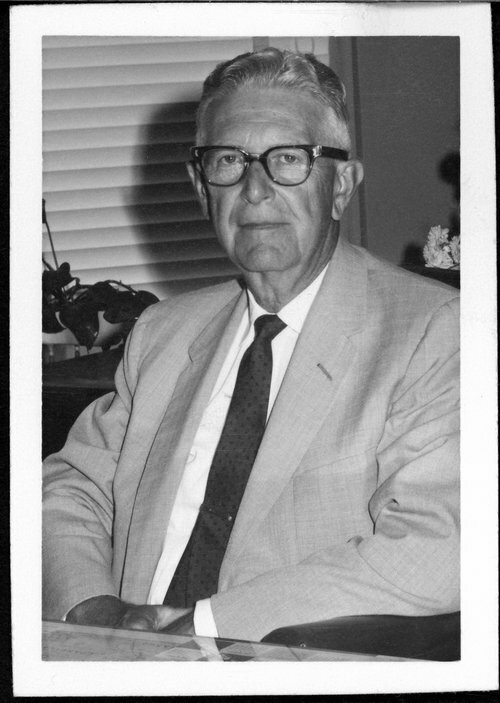 Photo of Lawrence Locke Rosenthal taken at the time of his promotion from Assistant Auditor to Auditor for the Atchison, Topeka and Santa Fe Railroad, Topeka. Rosenthal was born September 15, 1900 in Farmington, New Mexico. He graduated from Polytechnic High School in Los Angeles, California. In 1917, he started his work with the Atchison, Topeka & Santa Fe Railroad in Ash Fork, Arizona as a clerk in the agent's office. In 1918 he transferred to the auditor's office in Los Angeles as clerk. Over the years he rose through the ranks and in 1954 transferred to Topeka as Assistant Auditor of Freight Accounts. When he retired in 1969 he was the head of the Freight Accounts department.